﻿ How to Stand Out in an Overstuffed Inbox This Holiday Season » Red Mango Marketing! Black Friday, Small Business Saturday, and Cyber Monday. These three days represent one of the largest spending periods of the year. While you know email marketing is the most powerful tool to reach potential customers, how do you maximize your chances that customers will open your emails? Constant Contact is here to help you drive sales for a prosperous holiday season. We uncovered key insights around consumer behavior and email marketing around the start of the holiday shopping season. 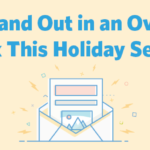 Check out the infographic below to find out how to stand out in an overstuffed inbox this holiday season. The post How to Stand Out in an Overstuffed Inbox This Holiday Season appeared first on Constant Contact Blogs. This entry was posted on Friday, November 10th, 2017 at 8:00 am	and is filed under Email Marketing, News & Updates, Small Business. You can follow any responses to this entry through the RSS 2.0 feed. Both comments and pings are currently closed.